Hey everybody! Today I turned two weeks old. That time just flew by, huh? As you can see from the picture above, I've been doing a lot of stretching, yawning, and all kinds of other motions. I've had a pretty good week. 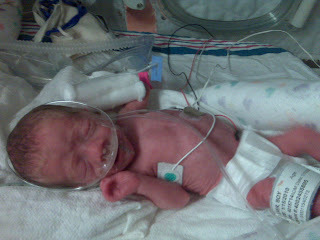 As of this morning I weigh two pounds, 2.6 ounces, and I'm still eating about eight times a day and breathing very well. Mommy and Daddy have been coming to see me every day, and it's always the best part of my day when they do! I'm very excited for next weekend, when my grandparents are coming in from Minnesota, and Aunt Amy is coming to visit from San Francisco! It's so great to meet and hear from my family. Daddy told me I have 67 relatives, if you count parents, grandparents, aunts, uncles and cousins, and they're spread as far as California, Seattle, Boston, and even Israel! That's me with my new friend Mr. Puppy, a present from Aunt Hannah the day I was born! Anyway, have a good weekend everybody. Thanks for all the happy wishes! Hey everybody! I had a really good weekend- I finished my phototherapy, and now they're feeding me up to 8 times a day! As a result, I'm really getting bigger- after I lost weight the first few days, I'm back up over my birth weight of two pounds, and I now weigh 2 lb 2.6 oz. Even better, I've lots of visitors! Uncle Stephen and Aunt Cheryl came by to meet me on Saturday, along with Mom-Mom and Pop-Pop, and Mommy and Daddy have been here every day too. 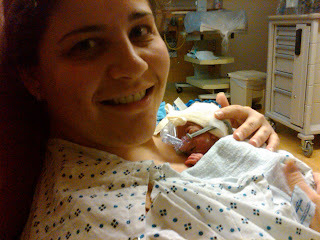 Mommy's also held me the last couple of days, and Sunday, Daddy got to hold me for the first time, too! He said it made him feel a lot better about the Vikings losing on Sunday night. Anyway, Mommy's here with me now, and Daddy's coming over later. They've been sending me everyone's happy wishes- thanks so much! 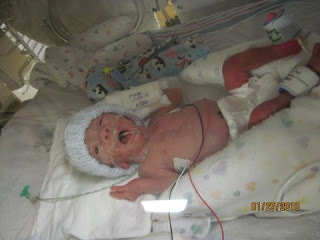 P.S.- Here's a picture of what Daddy looked like when HE was one week old. Don't you see the resemblance? Daddy says the way my hands are, I could be a boxer- probably in the super-duper lightweight division! I've been doing pretty well. This morning the nurses took off my CPAP machine, and instead I'm using a cannula tube, which is not as big. I'm also almost done with my phototherapy treatment. Basically, they shine bright lines down on me while they cover my eyes with a little mask, it's good for my eyes. Mommy and Daddy said the bright lights are sort of like a place we're going this summer, called the Shore! Anyway, Mommy is here now, and Daddy is coming over pretty soon. 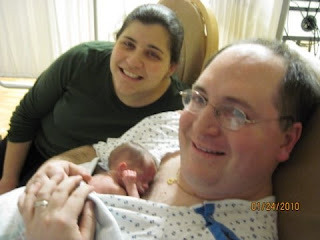 Then this weekend, Uncle Stephen and Aunt Cheryl are coming to visit, and I'll get to meet them for the first time. Have a good weekend everyone, and thanks for all the happy wishes! PS- Daddy told me to say, "Go Vikings!" He's never seen them in the Super Bowl in all of his 31 years, but I might get to in my first month! Hey everybody! Just wanted to say thanks for everyone who stopped by the blog in the first couple of days, it's so great to know that I'm coming into life with so many people who care about me! I'm having a good day today. 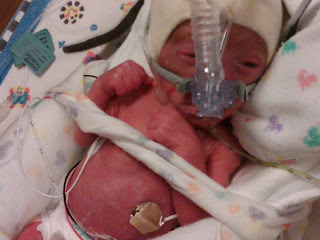 The nurses said I'm starting to gain weight again- for most preemies like me, we actually lose weight the first few days. I'm also breathing so well that I might be done with my CPAP machine soon, and I'm also going to be done with my light therapy too! The most exciting thing in the last day has been that Mommy and Daddy, along with my grandmother, visited last night. 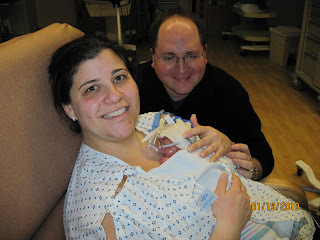 Not only did we get our first-ever family picture, but Mommy held me for the first time! It was a wonderful moment for both of us. Mommy's actually visiting me right now, and then Daddy's coming over after work. Mommy went home from the hospital yesterday, but I'm still so glad I get to see her every day. I'm also glad that Mommy got to go out for sushi last night- she didn't get to have any for all the time she was pregnant with me. Anyway, that's all for now- I was just born a few days ago, so I can't write that much at a time! You can leave comments at the bottom, and Mommy and Daddy will let me know about them. Be back soon! Hi, everyone! This is Noah. 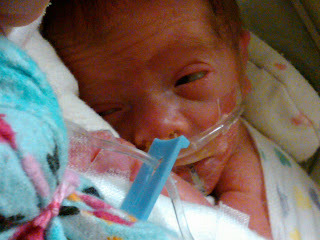 Mommy and Daddy made this blog for me so I could update everyone on how I'm doing. They said a lot of people have been asking about me, so here I am! 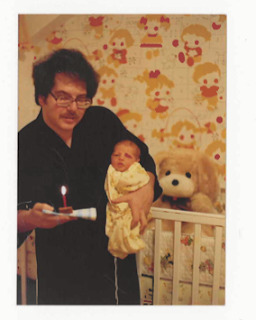 I was born January 15, here at Lankenau Hospital in Wynnewood, Pa., just a few blocks outside of Philadelphia. 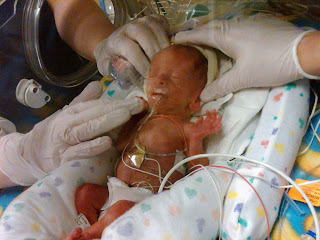 As you probably know, I arrived a bit early so I need to be in the NICU for several weeks. The important thing for everyone to know is that I'm doing great! I'm very tiny, but I'm breathing very well and my heart rate is good too. 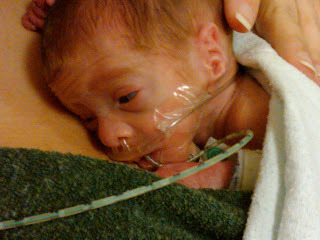 They're feeding me very little, but it's more than I can handle! They're also giving me a little bit of extra oxygen through a CPAP machine. On Tuesday, they took out my arterial line! All in all they say I'm making really good progress. The nurses here are taking very good care of me, keeping me nice and toasty and in a comfortable blanket. Luckily, Mommy and Daddy are up to visit several times a day. All four of my grandparents have been here too, and so have Aunt Debra and Uncle Jason, and Aunt Hannah and Uncle Kyle. I also can't wait to meet Aunt Amy when she visits in a couple of weeks! Anyway, I should be getting back to nap time. 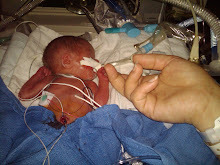 But please check back here from time to time, Mommy and Daddy will be posting pictures and stories about my progress as the weeks and months go by. Thanks for all the well wishes!